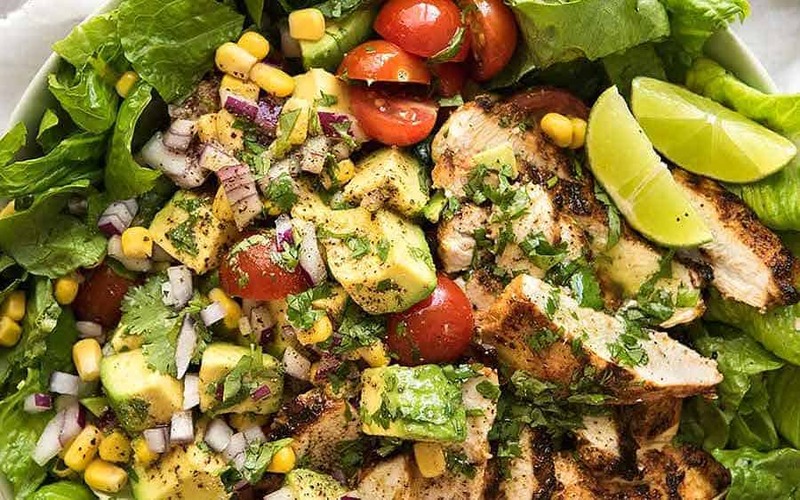 This filling Mexican Avocado Chicken Salad has all the essentials of a really great salad – it’s jam packed with fresh, vibrant flavours, big, creamy chunks of avocado and irresistible Mexican grilled chicken. 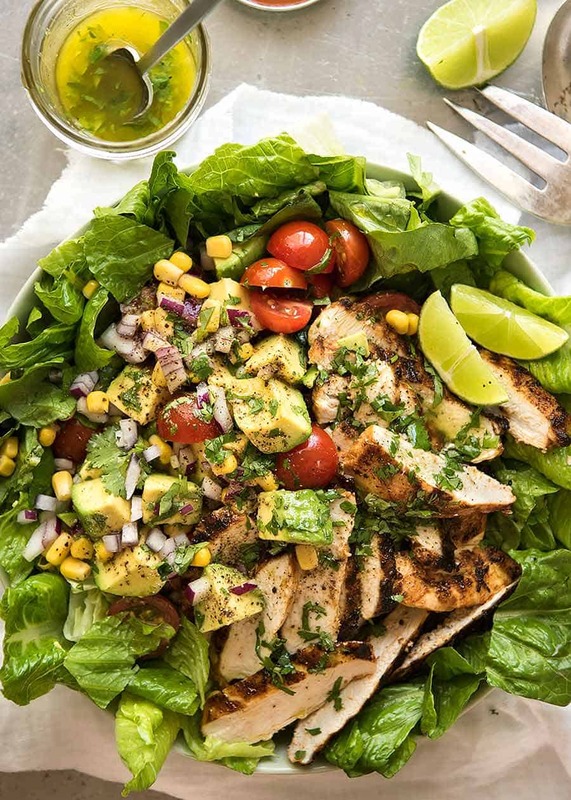 It’s like a giant salad version of Mexican Avocado Salsa – with the addition of chicken to complete the meal! To fill it out even more, try it with a side of Easy No Yeast Flatbreads, a southwest Cowboy Rice Salad or try some of these amazing easy No Knead Bread Rolls. 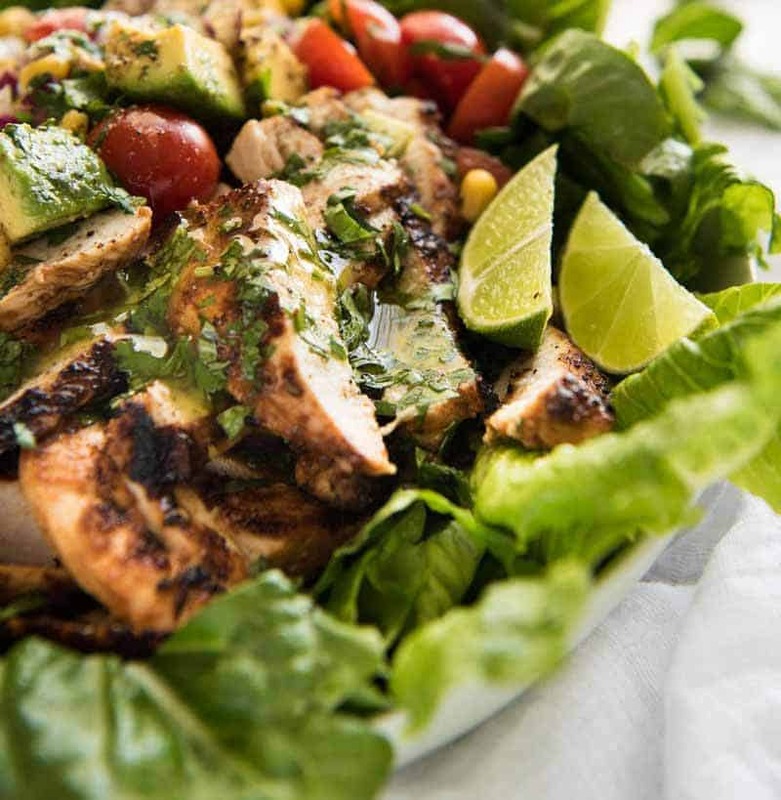 Avocado Chicken Salad – with Mexican flavours! I’ve had a Giant Salad* almost everyday for the past month or so. Hopefully it’s more than just a phase and it becomes just a natural part of my lifestyle – that I crave a salad instead of pasta. Or cupcakes piled high with the fluffiest ever buttercream frosting. Or fall apart lamb shanks. Or cheese or potatoes in any shape or form. OK. So that vision I painted of a holier-than-thou, new clean eating me is completely unrealistic. You know it, my mother knows it, and everyone who knows me knows it! Having said that, this is Avocado Chicken Salad is something that even non-salad-craving people like myself will love because it’s big, filling, interesting and packed full of flavour. 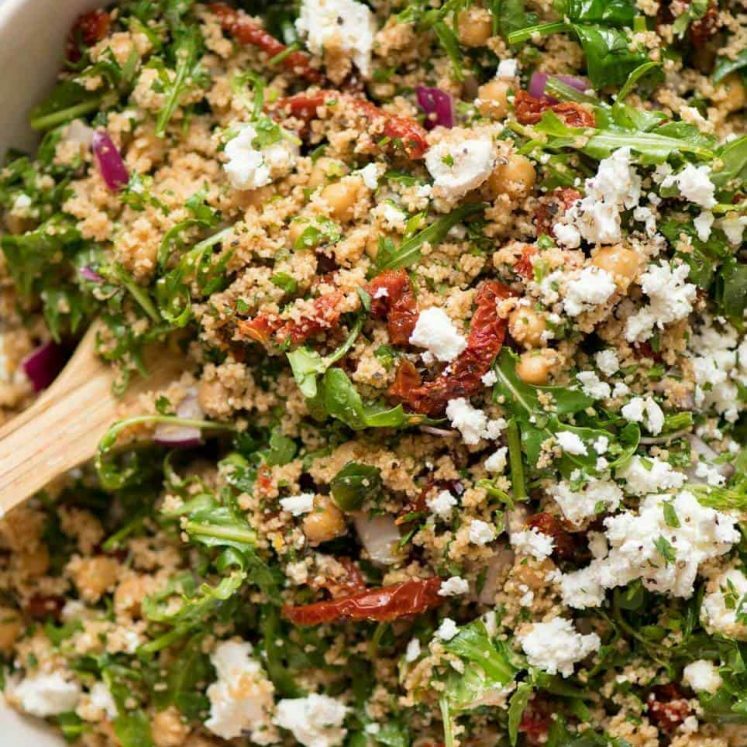 * The official definition of Giant Salad: flavour packed salads that are satisfying enough to have as a meal. No wimpy salads in my world!! All piled up over crisp lettuce leaves. So just to be clear, it’s not a traditional Mexican salad. It’s a big, fat, satisfying salad that’s packed with fresh Mexican flavours! This technique of a dressing doing double or triple duty is a highly effective technique I’ve been doing for as long as I can remember. I’m such a fan of it that it was the first theme I asked to do when I used to do regular features in Super Food Ideas magazine! 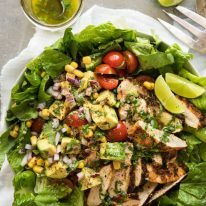 With all the things going on in this Avocado Chicken Salad, it’s a satisfying salad for dinner or lunch. Lots of nutrition, protein from the chicken, creaminess from the avocado, great textures, and a fresh dressing that’s anything but dull. If you want to add some carbs, try this with a side of Easy Homemade Flatbreads, add some lime rice (use this Lemon Rice recipe, just switch the lemon with lime), Cowboy Rice Salad, or make some of these easy No Knead Soft Bread Rolls. Mexican Avocado Chicken Salad recipe video! Recipe video above (see how I scoop out avocado!) 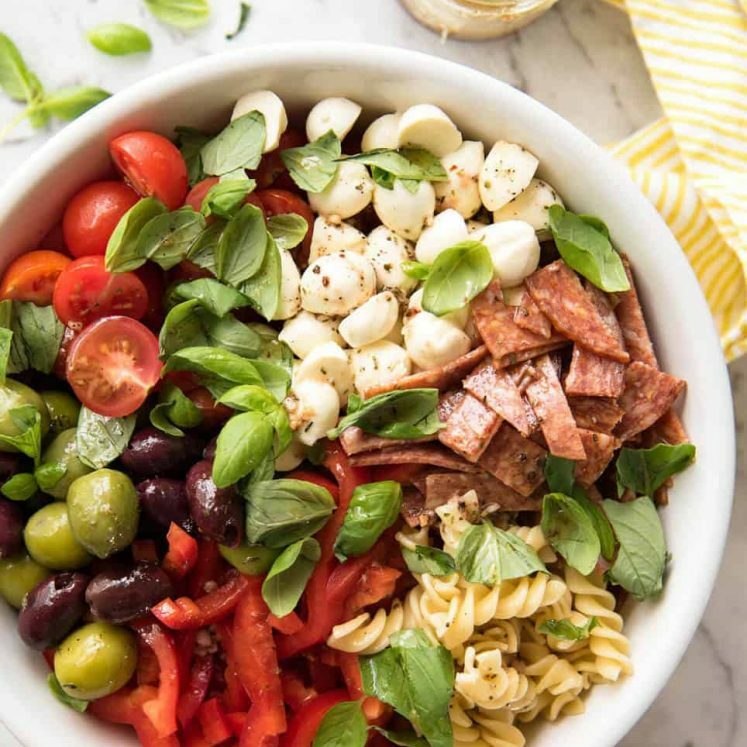 A fully loaded salad, satisfying to have as a meal! 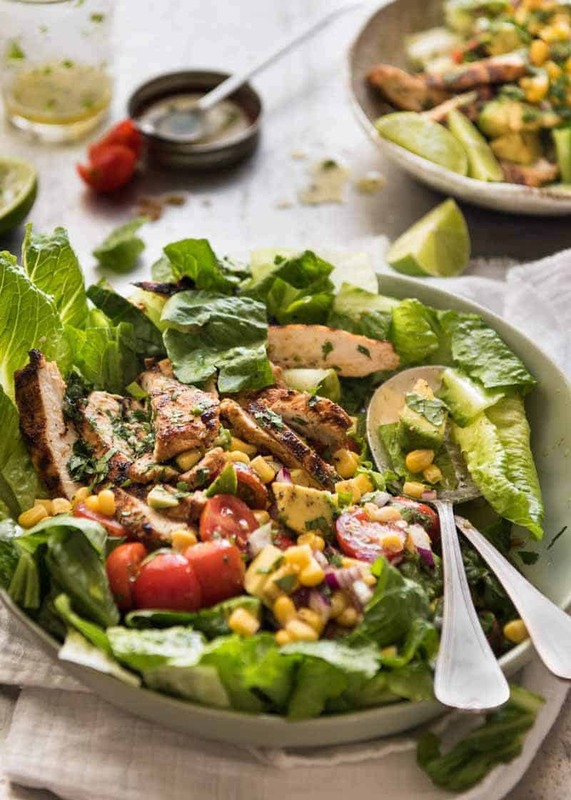 Crunchy lettuce, creamy avocado corn and tomato salsa, marinated Mexican chicken drizzled with a lime dressing. Makes 2 meal size servings or 3 normal servings. Marinate 30 min. 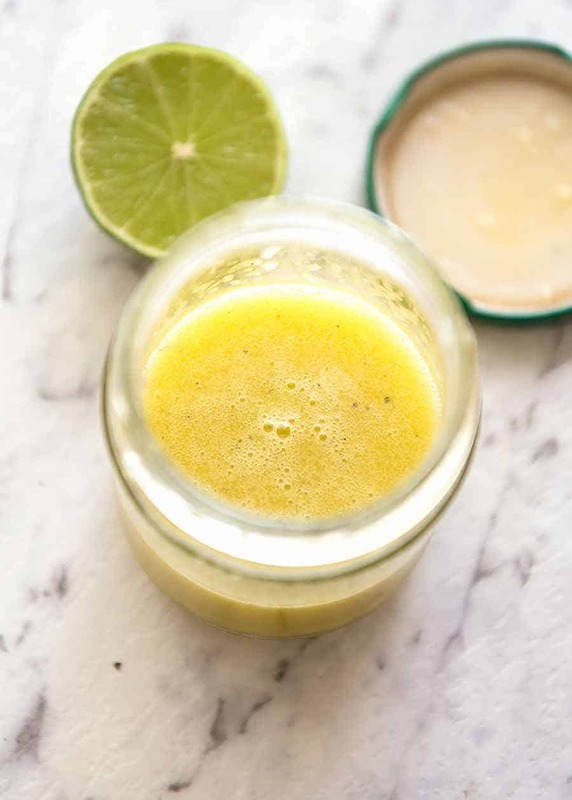 Place Lime Dressing ingredients in a jar, shake well. Put 2 tablespoons of Dressing in a ziplock bag. Add chipotle, oregano, cumin, salt and pepper, mix/squidge bag. Add chicken, seal and massage to coat. Marinate 30 min – overnight. Heat 1 tbsp olive oil in skillet over medium low, cook chicken to taste (2cm / 4/5” takes around 8 minutes), getting a nice brown crust on it. Rest 5 min then slice. Add 2 tablespoons of coriander into Dressing, shake. 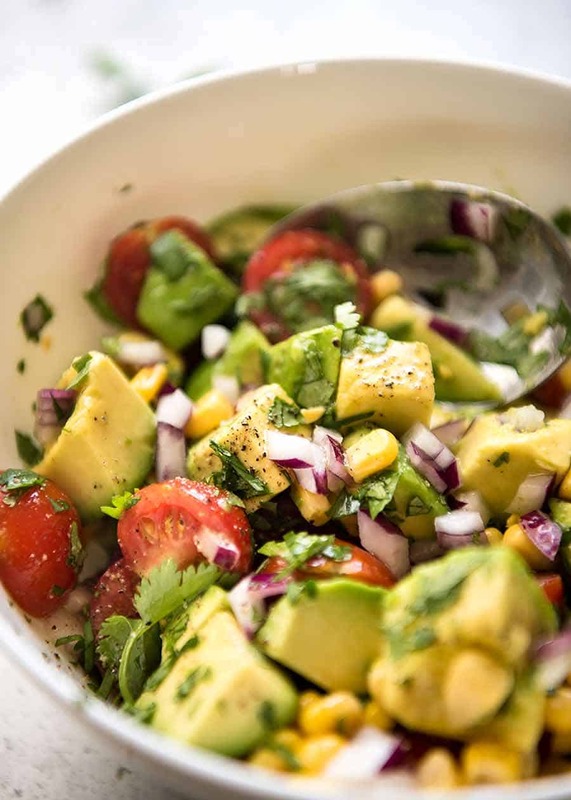 Place avocado, corn, tomato and onion in a bowl. Add remaining coriander, drizzle with a bit of Dressing, toss gently. Place lettuce in a bowl, drizzle with a bit of Dressing, toss. Assemble Salad: Place lettuce on a serving platter. Top with Salsa and sliced chicken. Drizzle with remaining Dressing. Serve. 1. Chipotle Powder is irritatingly difficult to find here in Australia!! It is a brilliant seasoning - it's like smoked paprika on steroids. More complex, more flavour, VERY Mexican (it's actually ground dried smoked jalapeños). I get mine from Firework Foods (online Mexican store), at some fruit & veg stores like Thomas Dux, sometimes from Harris Farms, stores that carry Herbies spices, and ethnic stores. SUBSTITUTION: Australia and non US- 1/4 tsp smoked paprika, pinch each of chilli powder, coriander, cumin. US - 1/4 tsp smoked paprika, 1/4 tsp chili powder (i.e. what the US knows as chili powder which is not just pure ground chili). 2. Nutrition per serving, assuming 3 servings. First published May 2017, post refreshed May 2018 - no changes to recipe. 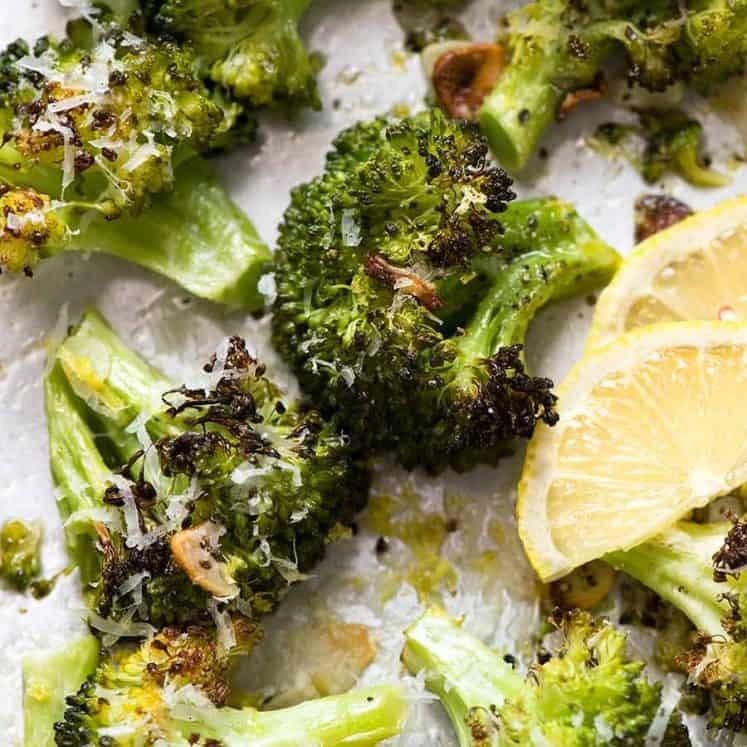 I have made this recipe several times now and my entire family loves it. I am making it for dinner tonight as I write. The only difference tonight is, I made a creamy avocado dressing to top it. 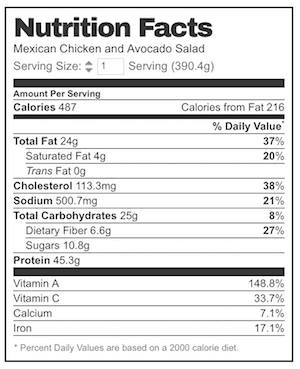 Where can I find the pan you used to cook the Mexican avocado chicken salad in , because I would love to get one for myself ? The salad looks so good that I just can’t wait to try it. And thanks again for sharing the pictures of Dozer. This salad looks delicious! I will be making it very soon, like tonight! All your recipes are awesome! Thank you for sharing. I love seeing pictures of Dozer. I have a golden retriever, named Harvey! 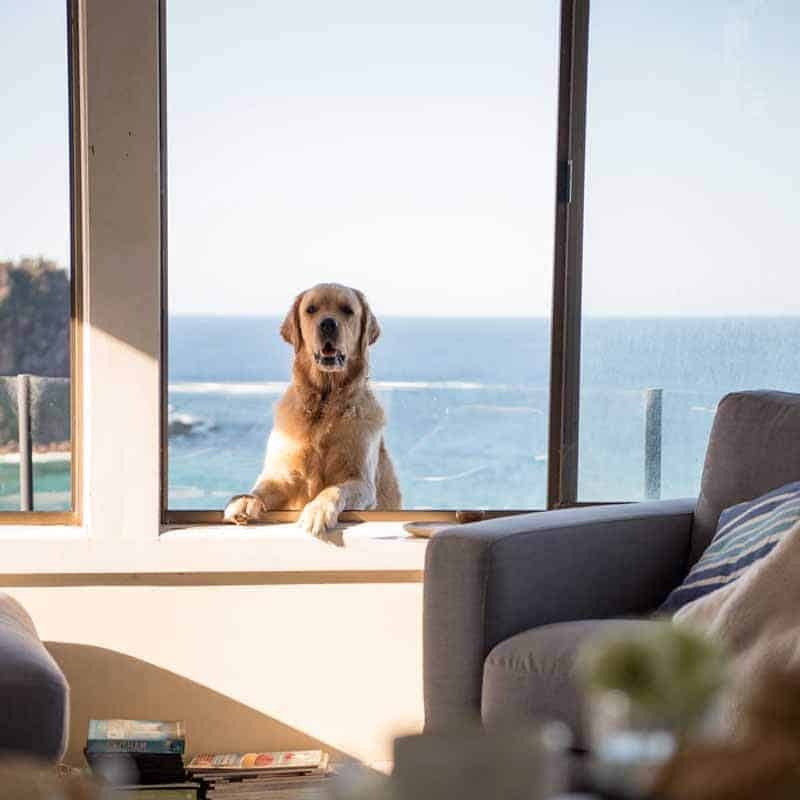 A great companion!